I really enjoyed all of the books I read this time around; Seinlanguage and Descent of Man were quick easy reads to split up the larger more involved books. If you're a fan of Jerry Seinfeld then you'll enjoy his book, it's his typical humor and thought patterns. Descent of Man is a collection of short stories that are... out of the ordinary and dark. Those are my favorite kinds of short stories! I actually picked that book up at Strand Books in NYC years ago and hadn't gotten around to reading it until this year. I think I'll look into what else he has written. 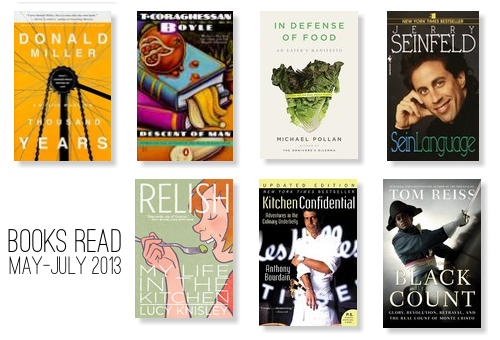 Apparently I read a lot of food related books recently. Relish is a cute comic book about the author's foray into the world of food at a young age. Food and drawings - is there anything better? There was a time in my life when all I read were 'independent' comic books so I really enjoyed this one and I look forward to reading her book about her time spent in Paris, French Milk. On the other end of the spectrum there's Kitchen Confidential, Anthony Bourdain's look at what life is really like behind restaurant kitchen doors. I wouldn't recommend reading this unless you've been inside the world of food; I think it's hard to believe until you've experienced it for yourself. Then there's In Defense of Food, which I highly recommend if you have any sort of interest in what you're feeding your body. I was so moved by this book that I've actually already written a post about it here. The Black Count was by far the longest and most involved book I've read in a long time. That's not to say it wasn't an absolutely enthralling read though! It's the story of the life of General Alex Dumas, the father of Alexandre Dumas (author of The Three Musketeers and The Count of Monte Cristo). His novelist son based those novels off of the real life that his father led. The Black Count covers a lot of different spectrums: history, race, love, and real heroes. I say it's involved because there are so many historical facts included in the book, but it does not at all read like a history book. These are the sorts of things I wish we would have been taught about in school. Maybe I would have paid more attention in history class! And last but not least, I'm still making my way through A Million Miles in a Thousand Years. The author Donald Miller is given the chance to re-examine his life after being offered a movie deal for his successful memoir. He starts to go on all sorts of adventures, in search of turning his life into story-material instead of the boring reality he's been living. It really makes you think about what kind of story you're living. I have a few books on queue that I recently purchased for my Kindle, so perhaps those will show up on my next B.Read list. Have you read anything interesting lately? Have any recommendations?